From the word "gyro" (meaning ring, spiral or circle) and "tonic" (to tone or invigorate), Gyrotonic® is a way of increasing range of motion, coordination, and strength by performing prescribed graceful, circular motions. 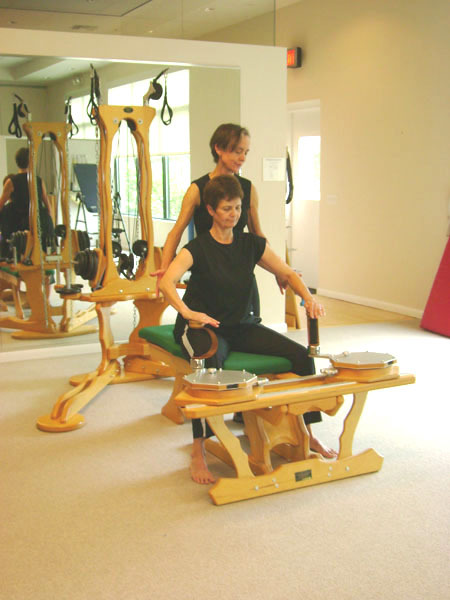 GYROTONIC® exercises employ movements found in swimming, yoga, gymnastics, and tai chi, using a pulley system. By moving through several variations of these motions with the light resistance of the Pulley Tower, the client can develop integration and mutually supporting action in all the major muscle groups. This Gyrotonic® Expansion System™ promotes multiple joint articulations, creating coordinated muscular power. It has been compared to and contrasted with Pilates but offers much more flexibility through circular patterns. Gyrotonic® (also known as the Gyrotonic® Expansion System or GXS) is an exercise system created by Juliu Horvath, an ethnic Hungarian born in Romania. Horvath, who was trained as a ballet dancer, sought asylum in the United States in the 1960s and then developed the Gyrotonic® system. After an injury, he began to practice yoga, and initially developed a system called "Yoga for Dancers", which eventually evolved into Gyrokinesis®. Although Gyrotonic® is becoming increasingly popular for fitness in major cities, at Balanced Body we are proud to have two - Laura Byrne, P.T. and Nancye Henkle-McPeek, P.T - of only a handful of physical therapists in the U.S. certified in Gyrotonic® and utilizing the method therapeutically. Gyrotonic® allows the therapist to help the client open up the thoracic spine and rib cage, improve rotation in the shoulder, and correct gait problems. Gyrotonic® is more challenging than Pilates, and may be contraindicated for those with serious bone density problems. It is, however, suitable for most other patients and ideal for fitness clients, particularly for those who want to improve their performance and stamina in sports such as golf, bowling, dancing, and other activities which emphasize rotational movements of the upper body and trunk.